Random House Books for Young Readers, 9780553538182, 224pp. Give the gift of this stunningly illustrated fairy-tale reimagining from the New York Times bestselling author-illustrator of The Wonderful Things You Will Be this holiday season—sure to be a modern classic! Snow and Rose didn’t know they were in a fairy tale. People never do. . . .
Once, they lived in a big house with spectacular gardens and an army of servants. Once, they had a father and mother who loved them more than the sun and moon. But that was before their father disappeared into the woods and their mother disappeared into sorrow. This is the story of two sisters and the enchanted woods that have been waiting for them to break a set of terrible spells. 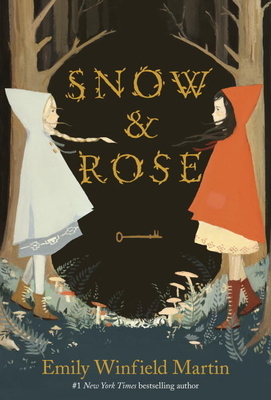 In Snow & Rose, bestselling author-illustrator Emily Winfield Martin retells the traditional but little-known fairy tale “Snow White and Rose Red.” The beautiful full-color illustrations throughout and unusual yet relatable characters will bring readers back to this book again and again. Emily Winfield Martin is a collector and lover of fairy tales, and the original Grimm’s tale of Snow White and Rose Red enchanted and haunted her all her life. She is a painter of real and imaginary things, and the author and illustrator of such books as Dream Animals and The Wonderful Things You Will Be. Emily lives among the giant trees of Portland, Oregon, and if you need her, you might look in the heart of the woods. Visit her online at emilywinfieldmartin.com.